"God loves everybody for who they are." Ali Forney was a homeless queer teen who was forced to live on the streets of New York during the 1990s. 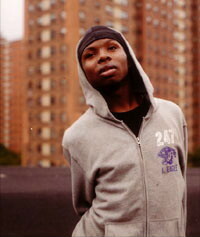 Ali was dedicated to the safety of other homeless queer youth; he was a committed HIV prevention worker, and aggressively advocated that the NYPD investigate a series of murders of the homeless queer youth he had befriended. Ali was an inspiration to those who knew him. In December of 1997, Ali was murdered on the streets. His tragic death called attention to the atrocious conditions for homeless queer youth in New York. Ali's murderer has never been identified. Ali He'shun Forney was born in Charlotte, N.C., his name reflecting his family's Muslim faith. As a child, he moved with his single mother to a housing project in Brooklyn. His mother, Treaver Forney, and her children don't want to talk about Ali's life or his death. But dozens of friends, social workers and street outreach workers speak of him, and hospital and court records and even personal writings and recorded interviews paint a vivid portrait: A boy who longed for a family, a singer who relished the spotlight, a young man with hard-earned street smarts who struggled with life, gave up, then struggled again. Ali's boyhood neighborhood of East New York is a world of poverty-blighted high-rises, beat-up cars, stark store fronts and warehouses. It's not an easy place to be a child. The area ranks near the top of the charts every year when it comes to violent crime. From an early age, Ali knew he was different from other boys, preferring to play with dolls and dress up in his mother's clothes. "It is frustrating trying to hide something you have to let out. I tried for years. But my mother knew something was there...," he wrote in 1993 in an essay for the Streetwork Project, a drop-in center for homeless teens run by the private, nonprofit Victim Services agency. As he grew, he became a gangly thing, all arms and legs -- a favorite target of the neighborhood's teen-age toughs and an awkward presence for his brothers. Once, preparing to pummel a young man in drag, they stopped short. "Oh (expletive), Ali, that's you!" he recalled one brother saying. By then, Ali was acting up in school, getting into fights and stealing. He was 13 when he was sent to live in a group home for troubled youths, but ran away within months. That began a four-year cycle of bouncing between the streets and foster care. He lived in at least four homes, including a state mental institution because of "volatile behavior"; he had barricaded himself in a room after being belittled by other teens. He turned his first trick at 13. After pocketing $40, he recalled feeling wealthy – "like Donald Trump." But he was "throwing shade," covering the pain, says Trevor Brown, who recorded Ali's story for the New York Peer AIDS Education Coalition. In those years, Ali spent his days hanging out on street corners or at Coney Island, hustling or stealing. The nights he was on the lam from foster care, he rode the last car of the E train, a subway line known among New York's 15,000 to 20,000 homeless teens as a hotel on wheels. It's a long ride, and at the last station you can get on the train going the other way without paying an extra fare. Sitting in a cramped office on the 22nd floor of a Manhattan high-rise, Inez Robledo stared across the Hudson River, tears welling up. It wasn't the first time that kids who showed up at Streetwork later turned up dead. She had most of them committed to memory -- names, ages and faces. Especially their faces. "They are all such babies, you know," she said. "They grow up fast on the street, learning how to get-over on people, stay alive -- things that nobody should have to learn. But in the end, you know, they are still babies, children." Ali was 17 when he walked through the door at Streetwork, a haven for homeless teens a stone' s throw from the West Village's meat-packing district -- a haunt of desperate kids used to making a few, quick bucks selling their bodies. At Streetwork, counselors helped Ali apply for a Social Security number and a medical card. He completed his high school equivalency exam. Video footage of a show at the drop-in center taken in 1993 shows a shy Ali peeking over the shoulder of another teen, his hand cupped over his mouth. He stared wide-eyed at the cross-dressing man in the sequined black gown belting out Chaka Khan's "I'm Every Woman." "I saw myself," he later told Ms. Robledo. Soon the pants he wore turned into shorts, and the shorts into skirts. He found a more comfortable place to live, a group home for gay youths. He found some peace. His 18th birthday brought him a $10,000 settlement from a childhood traffic accident. Waiting for it, he talked of little except using the money to reunite with his family. "He'd say, ‘I'm gonna get that money and go home, and everything's going to be good again,'" Ms. Robledo said. When he received the check, he bought gifts for his younger brothers. He also took out a life insurance policy, naming his mother as beneficiary. He left Streetwork full of hope. But days later he was back, despondent, Ms. Robledo recalled. It hadn't worked out was all he would say. Ali met Dion Webster and Kevin Freeman at Streetwork. Webster was tough, smart-mouthed, quick to anger and wise beyond his years. He had been on the streets more than half of his life, he told people. He was 18. Freeman was the reserved one, distant, sharing little with people. He was 19. Together, they formed a family of outcasts. "They didn't have a family of their own, so they created one for themselves," said Siciliano, director of Safe Space, another drop-in center. And together the three worked the streets. By day, East Harlem's Marcus Garvey Park is a breath of fresh air in a concrete jungle of housing projects; by night, it is a blanket of darkness with pools of hard light from street lamps. But it was convenient to their new part-time home -- a shack built out of discarded aluminum siding, rubber tires and bricks. It became a home of last resort after their eligibility for New York's youth shelters ended at age 19. It was then Ali's drug use escalated, his drug of choice crack cocaine, $5 to $10 a vial. The drug eased the degradation and fear of selling himself, he said in the AIDS coalition interviews. Life was closing in: In 2 1/2 years, Ali was arrested 42 times. Jumping subway turnstiles. Possession of drugs. Prostitution. He went to jail at least seven times. His appearance became outlandish -- a wig, skirt, combat boots and a two-day stubble. With an exaggerated walk, small steps and arms bouncing, the once shy boy now called himself Luscious. Despite the drugs and the prostitution, Ali attended counseling sessions at outreach programs. The meetings were an outlet. He developed an aptitude for peer counseling and became an advocate for street safety, preaching commandments for self-preservation. One of them: Always make sure somebody sees you go with a trick. He wore a black vest jacket with a back pocket filled with condoms that people could take as he passed by. He bragged about being HIV negative. With outreach workers, Ali pounded the pavement. "I approach the drug dealers and (say), ‘I'm buying some drugs, you want some condoms?'" he said in the AIDS coalition interviews. His work brought attention and he was invited to San Francisco in 1996 to tell social workers about the needs of homeless transgendered kids. "If he saw a future for himself, this was it," Ms. Robledo said. He stood before a crowd, recounting his story. Afterward, many congratulated him. But no one offered him a job. The corner of East Harlem's Third Avenue and 122nd Street is quiet, except for the sound of high heels striking concrete. The garages and stores are shuttered. Christina Devoe steps out from behind a tree, wearing a red minidress, walks toward a car and leans in. The man behind the wheel shakes his head and drives off. Devoe, a 35-year-old transgender whose real name is Christopher, has worked these streets for more than a decade. This is someone who does not cry easily. But the voice softens, recollecting the three boys. Devoe was the one who called them the Three Musketeers. "They were sweet kids. It shouldn't have happened like that," Devoe said, recalling one cold night: Nov. 4, 1996. Ali stood on the street corner shivering, pleading with Webster to call it a night. Freeman had already left. "I promise we'll leave after this one," Webster said. "This is one of my regulars." It was the last time they ever spoke. When Webster didn't return, Ali headed home -- a spot on the floor of Devoe's apartment that he shared with Webster. When he awoke hours later, word was already out among the transgendered prostitutes that one of their own was dead -- knifed in the head. At the police precinct, Ali identified his friend. "He cried and cried and cried. It's like his whole world sort of caved in," Ms. Robledo said. Then, according to Ms. Robledo, Devoe and others, he told the police everything he saw: the make and model of the car, the description of the john and how he was one of Webster's regulars. Police turned down repeated requests by The Associated Press to discuss the allegations, the murder or the suspected murderer. Ali hit the streets nightly for weeks after the murder, working the same area, hoping to glimpse the killer. Weeks turned into months. Nothing. "After that, Ali just went downhill," said Ms. Robledo. "In his eyes, he had lost the only family he had ever had." Ali cursed the police. Once, in a meeting at the AIDS coalition, he wondered aloud when he would join Webster. He attempted suicide twice, with overdoses. His drug use increased. He dropped weight. He got into fights. He was kicked out of outreach programs. Although Ali and Freeman still hung out sometimes, Webster's death, for whatever reason, had driven a wedge between them. By spring 1997, shortly before his 21st birthday, Ali was trying to put the death behind him. He moved in with a friend who gave him money, lessening the lure of prostitution. But soon, he was lying to sneak out. "I would tell him I was doing outreach. I would get high." Meanwhile, Freeman was getting into trouble. He was making deals with drug dealers, promising to pay later -- with interest -- but failing to pay. Freeman's body was found by a passerby -- face down in the dirt at Marcus Garvey Park on June 20, 1997. His skull was nearly split in half. Word on the street was that Freeman was killed in a drug deal gone bad. Ali reportedly knew the dealer; they had done business. The Safe Space Talent Show is a favorite among street kids. It's one night when they can dress up and show off for an approving audience. It was Ali's favorite night of the year. Here, he was the star. From its beginning in 1995, Ali sang in the show. By 1996, he was closing the show with a preacher-style oratory put to music, known as "hymning." It was a talent he picked up as a child singing in the church choir. and sometimes it's hard to tell the night from day. as I keep my eyes upon the distant shore. I know he'll lead me safely to that pleasant place he has for me." The telephone call came the morning of Dec. 5, 1997. The police officer said he had a John Doe at Harlem Hospital. Ali, Siciliano thought. Just four days earlier, he had talked with him. Ali was sitting in the 49th Street subway station. "I haven't seen you in a while," Siciliano said. "I've been away," Ali told him, explaining he'd been in jail for drugs. Siciliano remembered asking him what he was doing. Ali told him he had a date, meaning prostitution. Later that night, Devoe saw Ali and remembered him saying he had something he had to take care of: He had taken drugs from a dealer and had promised to pay the next day. But before he could, Ali had gone to jail. At 4 a.m., police responded to a 911 call: Shots fired; a man down on the sidewalk in front of a housing project on East 131st Street. No I.D. Yola Norville stood in the hospital room staring at the body swaddled in white, life support machines attached. "Yes," she said. "That's Ali Forney." Siciliano had sent Ms. Norville, a coworker, to identify the body. "He looked like he was sleeping," she said. The bedding was tucked around his body with only his shoulders, arms and head protruding from the white cocoon. A woman stood at the bedside, crying. She introduced herself as Ali's mother. "Mother?" Ms. Norville thought. She couldn't bring herself to tell the woman that Ali told everybody she was dead. Then Ms. Robledo arrived. "He looked like that boy who I had first met," she said. "It's like all those years and experiences were washed away from his face." When homeless teens die in New York City, a memorial service is held at a Times Square church. Ordinarily, it is in a small sanctuary. But when 75 people - street kids, outreach workers and the Forney family - showed up, Ali's memorial was moved into the church' s main sanctuary. One by one, people paid tribute to Ali. Some called him Luscious. Ms. Robledo, who still keeps Ali's lapsed life insurance policy in her desk, said some words. So did friends from Safe Space. The year of his death, Ali had closed the talent show singing, "God loves everybody for who they are." At the service, Siciliano closed the book on his life saying the same words. Those who did not know him might miss the human being under all those labels. But at his memorial, held at a Times Square church, 70 friends and relatives gathered to remember a complex man. Six months before his death, he closed a talent show at a center for homeless youth with a gospel song and a prayer, preaching that "God loves everybody for who they are." Our mission is to help homeless LGBT youth be safe and become independent as they move from adolescence to adulthood. Too many of these youth are rejected by their families and the broader community, and are thus forced to survive on the streets, facing the dangers of violence, HIV infection and homophobia. AFC is committed to providing homeless LGBT youth with the services they need to thrive, including shelter, HIV prevention and vocational training. New York City can be a brutal place for homeless youth and tragically, many young lives have been destroyed. At AFC, we are making a difference by rescuing kids from the dangers of the streets and placing them into our safe, homelike environments. AFC is working hard to provide our youth with the support and nourishment they need to succeed and thrive. We cannot do this work alone. We need the help and support of the broader community to make NYC a safer place for homeless LGBT youth. Thank you for your support and interest. © 2004 The Ali Forney Center. All rights reserved. Those who did not know him might miss the human being under the "labels".